Troutbeck, a small tranquil village situated 3 miles north of Windermere town, is a conservation area and home to the National Trust property of Townend. Townend is an atmospheric 17th century Lakeland Yeoman farmhouse full of quirky objects and fascinating stories. The farmhouse was the home of the Brownes an ordinary farming family but today their home and belongings bring to life more than 400 years of extraordinary stories. The bunk barn built by George Browne in 1666 and extended in the 18th century is one of the very few surviving bank barns in the area still in use today. 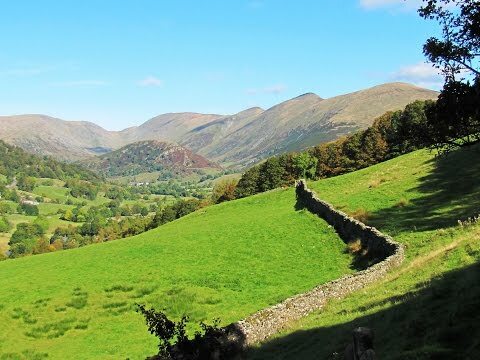 There is plenty to explore at Townend such as the cottage style garden, the bunk barn, tours, visiting peaceful Troutbeck and walking the beautiful surrounding fells. There is also plenty to keep the kids entertained on the kids trail, the Townend quiz on one of the guided tours, play traditional games and a scavenger hunt around the cottage garden. The village also houses a combined Post Office, general store and tea shop and a pub The Mortal Man which serves and displays a verse with reference to Sally Birkett’s Ale. Dubbs Road is an old drovers’ road situated on the eastern flank of the Troutbeck valley. The road from Moor Howe climbs steadily passing Dubbs Reservoir to meet Garburn Road (track) offering wonderful views of the valley and the fells. The track continues on to Garburn Pass before dropping to Kentmere village. Dubbs Reservoir originally built to supply water to Windermere is now used as a supplementary water supply for the Thirlmere Aqueduct and also as a trout fishery. It is only a small reservoir but the dam is nearly as long as the other three sides of the reservoir put together and is surrounded by a high wall that prevents entry except for fishermen. Allen Knott owned by the National Trust is a small steep outcrop of about 200 metres (656 feet) situated to the north east of Troutbeck Bridge. A barely visible Dark Age British hillfort once occupied the summit. Part of the fort which was maybe used as a lookout post was cut away by the quarrying on its northern side. The site was excavated in the 1960’s. From the summit almost all of Lake Windermere can be seen along with superb views of Gummers How, Orrest Head, the Langdale Pikes, Crinkle Crags, the Old Man of Coniston and the fells surrounding Kirkstone Pass. From the car park we walk forward to the main road (A592) and turn right over Church Bridge. After a short way we turn left at the signpost Kentmere 3¾ miles. When the track splits we turn right uphill. When we reach the trees we turn right over the stile and head slightly right to cross over the next stile. We turn right onto Dubbs Road and follow the track past Dubbs Reservoir until we meet Moorhowe Road. We turn right following the minor road for a short way then turn left over the stile at the public footpath sign Near Orrest Farm ½ mile. We head forwards to the metal gate and turn left with the wall on our right until we come to a stile. We turn right over the stile and head forwards through the gate. We keep heading forwards to go through the gate in the corner of the field then bear slightly right past a telegraph pole to a stile. We turn right onto the road passing the farm on our right and when the road drops we cross over the stile in the wall in front of us signposted Far Orrest ½ mile. The path bears left then we head forwards through the fields going over the stiles until we go through a gate at the side of Far Orrest Farm. At the back of the farm we go through a gate and turn right along a little track sign posted Troutbeck. We go through another gate turn immediate right uphill to the summit of Allen Knott. We retrace our steps back down to the wall and head forwards with the wall on our left. We soon go through a gate then bear slightly right across the field to the minor road (Moorhowe Road). We turn left and follow the road which bears right to meet a t- junction at the main road, A592. We cross the road and turn right to the bus stop and public footpath sign. We turn left through the gate and head downhill to cross two footbridges. At the road we turn right heading forwards past Town End Farm and the National Trust building of Townend. After passing the small combined shop, post office and teashop we turn right at the junction and make our way downhill to where we parked our car. This is an easy to moderate walk on tarmac road, stony and grass tracks and paths. There are a few inclines and declines. Elevation: approx lowest point 117.4m (385.2ft) approx highest point 275.9m (905.2ft) approx ascent 354.3m (1162.4ft). Approx 5.8 miles allow 3 hours using OS Explorer Map OL7, The English Lakes South-eastern area. This walk is clockwise. Start point: Green Gate just off the A592 at Church Bridge near Troutbeck Jesus Church. Troutbeck is just off the A592, Windermere Road, in the Lake District, Cumbria. From the A66 take the A5091 sign posted Troutbeck and Ullswater. Follow the A5091 until it joins the A592, on the edge of Ullswater, turn right and follow the road through Glenridding and Patterdale. By-pass Brothers Water and Hartsop then continue along Kirkstone Pass. Troutbeck is just off the A592 on the right about 2 ½ miles from Kirkstone Pass and the church where we park is about half a mile further on. Parking: Green Gate (small road) next to Church Bridge just past Troutbeck Jesus Church on the A592 or at the side of the road near the church and limited parking in the village. Free parking. There is no public toilets on-route the nearest ones are at Windermere. For refreshments at Troutbeck there is the Mortal Man Inn and a combined Post Office, General Store and Tea Shop. There are ample pubs, restaurants, cafes and shops in nearby Windermere and Ambleside.